Time to look at the first connect 4 app title I’ve ever played. It’s pretty impressive how much the genre has exploded. There are hundreds of apps on the market just like these. Candy Crush is really what started this segment of the market and it has since grown into something pretty impressive. It is definitely a really fun genre but just playing one or two of them is enough for you to have your fill. Taking on more would just be overwhelming. For me Lollipop was the first and also the best. You probably already remember the gameplay from my Fruits Mania review so I shall be brief. The goal of the game is typically to match a lot of candy. You can do this in pairs of 3 or greater. The longer the match, the better the reward. A match of 5 will get you the rainbow orb which can destroy all candy of a single color which is extremely handy. Other levels have you trying to match near cookies or getting a cake from the top to the bottom. There are certainly quite a few variations for the levels. I’d say that the best kind is when you have to break a large number of crackers. Those are just the most satisfying to play. You still need strategy but you can just jump in and start marching. The worst levels are the ones that pop up really late in the game where there will be prisons outside the level and the only way to hit them is to detonate a row bomb in just the right row. It just feels like you need a lot of luck to clear a level like this and the game is basically just telling you to buy the item that you want. This is the kind of game that is definitely pay to win as buying an item like this will really come in handy. The main game mode is the only mode in the game as you would expect. The replay value is in the sheer number of levels that are included as getting through all 1000+ will be considerably tough. Not to mention that the game is still going as well. You’ll burn out if you try to go through them too quickly so it’s important to just go through a few at a time. Naturally if you are a huge fan and don’t think this will happen to you then you should go ahead and play to your heart’s content. There isn’t much to say about the graphics or the soundtrack since it is all the most generic themes you can think of. They certainly feel like they are all free domain themes and there isn’t any real variety. It would be nice to have something more than that, but it isn’t entirely unexpected considering that this is a pretty low budget game anyway. The company must have a huge profit margin here because they have 10 games of more that are exactly the same as the others, only they are slightly altered visually. A unique mechanic here or there, but it’s likely not hard to maintain compared to other games. I do think the game looks a lot better than Fruits Mania though because of the color scheme. Blue just pops out and the island esque theme just looks more impressive. It’s definitely quite subjective though. The app market has really taken off and after laying some of these games I can see why. They certainly are no replacement for console games and if given the option I would choose the latter every time. However, it’s the times where a console game isn’t available that these really shine. Since the levels are quick it is ready to be played at any time. The levels are quite fun as well so it will always remain a tempting option. I could easily see a more dedicated app player beating all of the levels and moving on to one of the other versions just to get more levels. Naturally as this is a very mainstream app game there are a bunch of pay to win mechanics. You can buy whatever items you want with real world currency. They are fairly cheap but once you’ve bought enough the total will definitely start to spike. Any level can become a cake walk if you buy enough items. It’s one thing Pokémon Go has always done well. You can’t buy candy, stardust, exp, or Pokémon. Without the option to do those things, it effectively prevents the P2W strategy. You will still have an edge if you spend money but it’s not quite as immediate or obvious as in other games. Sonic Forces is unfortunately like this one in that regard as you can just keep buying more loot boxes until you are maxed out with your level. 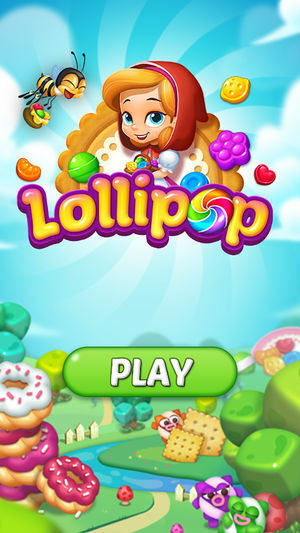 Overall, your enjoyment of Lollipop will likely depend on how many of the other clones you’ve already played. If this is your first one, then that’s perfect. It will feel really fresh and you’ll be absolutely engaged with the game. If you’ve played others, then this will just seem like more of the same. There aren’t any bells and whistles here. It’s just the gameplay, take it or leave it. At the very least, I know it’s an app that I can easily use to pass the time by, but more often than not, I have other options for that. This entry was posted in 7 Star Games, App Games, Game Reviews, Games, Reviews and tagged App Game, Apple, Connect 4, Free to Play, Game Review, IPhone, Lollipop, Match to win, Mobile Review, Mobile Title, Review, Video Game Review by dreager1. Bookmark the permalink.